Wabi-Sabi: More Biscuits. Fewer Guns. I am so dismayed at the news that there has been yet another mass shooting earlier today. This time in San Bernadino, California. It has been almost 3 years since the tragedy at Sandy Hook Elementary, and our collective response has been to ignore the problem and pray for the victims. It is a national disgrace. Opponents to gun control say the answer to this violence is more guns. Even though the United States has more guns than any other nation in the world and not surprisingly has the highest number of deaths involving the use of a firearm. Other countries have fewer guns and fewer deaths. We have more guns and more deaths. The availability of guns is not making people safer. To illustrate just how ubiquitous guns are in our state, I took a look at the directory of Federal Firearms Licensed Dealers in my home state of West Virginia. Did you know that there are 1,182 licensed dealers? 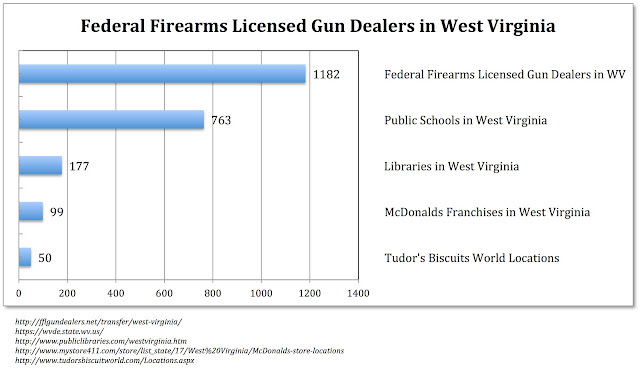 Thats more than 11 gun shops and gun dealers for every McDonald's in our state and more than 23 dealers for every Tudor's Biscuit World. We need more biscuits and fewer guns.